Love Dentists or should I say hate? Love horror type escape rooms? If so then No Escape London’s room Dentist room will be right up your street. It is said that the Dentist who runs this Dentist has a grizzly secret. It is your mission to solve who lays dead within the Dentist room before the dentist returns. 60 minutes and counting. Thanks to No Escape London for letting some of us from Love Pop Ups London community come down to have a dental appointment or should I say game. Read all blogs/reviews from the comment section from below. 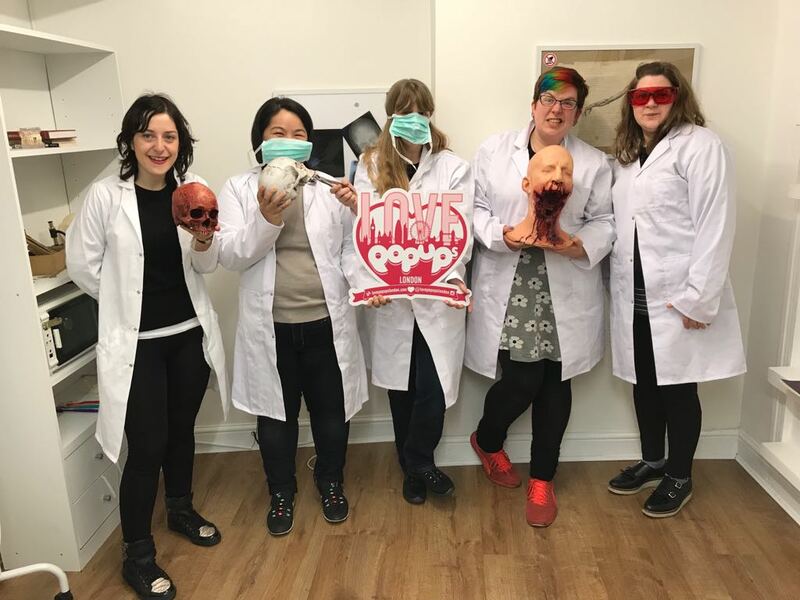 I was invited to try No Escape London‘s Escape The Dentist room with Love Popups London, and as someone with a severe dentist phobia, I just had to challenge myself to try it out. When I was asked, if I was afraid of the dentist, my initial reaction was why? Well simple would you like to experience an escape room based on your deepest fear? Of course! A challenge I accepted. No Escape London is hidden away on Oxford Street – quite a feat in itself! To find it you go into the Londis newsagent and to the left you’ll find several storeys of narrow stairs. At the very top of the building is the escape room. The building is a little short on space, so we had to squeeze on to a little landing to wait for the group before hand to come down first, but once we reached the top the staff were very warm and welcoming. Having checked out the website beforehand, I had slightly built up my fear of what would be inside the room of a murderous, serial killer dentist – instead it was a plain white room set up like you’d expect most dentists, with some antique props and pieces of furniture. For an escape room newbie the clues where the right side of challenging-but-not-impossible. We did initially escape the room early as it hadn’t been properly reset, meaning one of the padlocks hadn’t been closed properly and we were able to access some clues quicker than we should have, but we stayed in the room anyway to find those clues and still managed to escape with a fairly respectable nine minutes left. If you’re new to escape rooms, then this place would be a good starting point to learn the basics of how the clue hunting works. But I suspect more regular escape room attendees might find it a little on the easy side. As someone with a severe dentist phobia, when I heard the LovePopups Community were heading to an escape the dentist escape room, I was super game! The escape room is located at the top of Londis Newsagent and involves a few steps staircases, before you’re transported into the dentist surgery. The signage to get there is not the best (but I’m told this will be changed very soon), luckily google is very helpful with locating the room. The escape room itself has a waiting room, which we sat in, before it was our appointment. Once we were psyched and ready to go, we entered the dentist surgery, which was full of teeth, X-rays and lots of dentistry tools… From then the race was on to escape, before the 1hour was up and it was our time to sit in the chair. The clues were solvable and left enough for all 6 of us to have something to do. We mastered the room in 51 minutes.. no mean feat! I think overall given the size of the escape room, it’s more suited to 4 people. If you’re in town, it’s definitely worth checking out if you want an escape room with a theme!